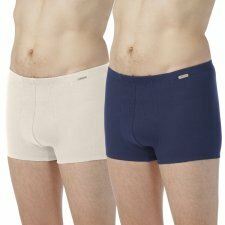 Fairtrade Underwear, for conscious consumers! The favorite lingerie for fashion and environmental awareness: with Comazo | Earth here is the first company in the German textile with a collection for men, women and children on the market, their biological raw materials from 100% Fair Trade. Organic cotton is certified GOTS and all items are sewn and packaged in Europe. Great boxer made of fine organic cotton. Fairtrade, GOTS and PETA certified. Waistband and leg processing with fringed rubber. The trunk has no side seam. Let yourself be inspired by the pleasant fabric. An incomparably soft feeling on the skin. Boys slip in fair trade organic cotton. Slip made of fair trade organic cotton. Fairtrade bra made of skin-friendly organic cotton. The cups are molded. The bra has no underwire, but conjures up a nice cleavage because of the spacer. All rings and adjusters are nickel free. The straps are very comfortable and adjustable as desired. The bra goes to the back: 3-way adjustable hook and loop closure. He is Fairtrade certified. Optimal fit due to the elastane content. Sits perfectly. Do not press anywhere. The perfect feel-good underwear from sustainable comazo | earth collection. Made of 92% cotton and 8% elastane. VEGAN and Fairtrade. Made in Europe. Beautiful fairtrade bra shirt made of skin-friendly organic cotton. Fairtrade and GOTS certified. The shirt has gathered cups, which are partially provided with noble lace. The lace is lined with cotton fabric, so nothing rubs and bothers. The narrow underbust rubber gives the perfect fit and the right shape. Decorated in the middle with a bow, which lends the wash the playful touch. The rings and adjusters are nickel free. The bra shirt has side seams and is slightly waisted. Flatters the silhouette. The carrier length is 32cm. Made of 92% organic cotton and 8% elastan. Wireless bra in organic cotton high-quality cup with a double layer of fabric and side reinforcements for perfect support. Adjustable straps. Closure in back with hooks 3 position. Composition: 92% organic cotton and 8% elastane. Color: white, plum, black or light gray. Beautiful soft bra without a strap made of skin-friendly organic cotton. Fairtrade and GOTS certified. The cups are decorated with a noble lace and are covered with a cotton fabric. The wide underbrush rubber ensures a perfect hold. In the middle is a decorative loop, which gives the whole a playful impression. The rings and adjusters are all nickelfrei. The bra closure is located at the back: 3-way adjustable hook and eye closure. This linen provides high quality workmanship of the finest materials. Made of 92% organic cotton and 8% elastane. Girl slip in fair trade organic cotton. High rise slip made of 100% fair trade organic cotton. High waist rise slip made of 100% fair trade organic cotton. Low rise slip made of 92% fair trade organic cotton and 8% elastane. Low rise slip made of 100% fair trade organic cotton. Mid rise slip of high quality organic cotton. Flat side seams. Flat elastic at the waist and legs. Shorts for children in organic cotton. Shorts made of 100% fair trade organic cotton. Color: white, bright blue or navy. Chic short pants made of organic cotton. Fine double rib with dividing seams on the front. Fairtrade and GOTS certified. Comfortable woven waistband with contrasting stripes. High-quality processing of the finest materials. Leg processing with fringed rubber. Stylish lingerie for men who care about sustainability. Great slip made of fine organic cotton. Fairtrade, GOTS and PETA certified. Waistband and leg processing with fringed rubber. The trunk has no side seam. Let yourself be inspired by the pleasant fabric. An incomparably soft feeling on the skin.